Experiments and projects with a Silhouette Cameo cutting plotter, including instructions for how to make an integrated card stand for cards with the fold on top, and a technique for cutting out a stamped image. 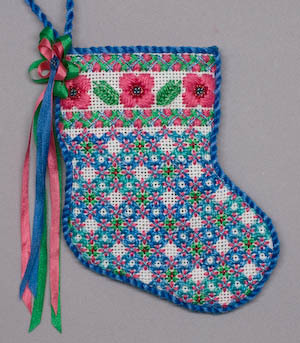 Finishing a canvas stocking – Instructions showing how to finish a petite stocking worked on canvas. If you have any comments, you can email [info] at this domain.